Indonesia Business Links (IBL), as a part of Alliance for Integrity (AFIN), was actively involved in the Integrity Week series, which held in April 17 – 20 April 2018. This Integrity Week raises the issue of regulatory developments related to corporate crime and political donation as a main topic in the business integrity forum. 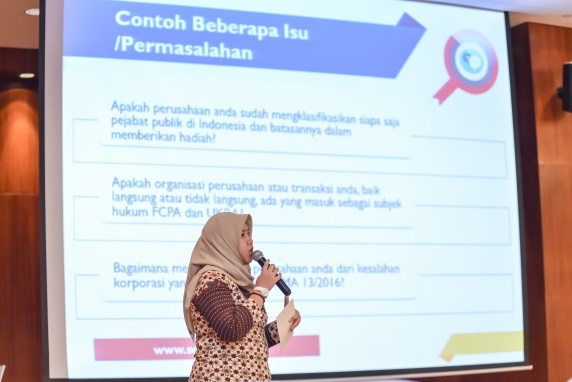 On this occasion, IBL presented SOLUSI (Sarana Olah Informasi dan Konsultasi Anti Korupsi) as one of the channels to prevent corruption in private sector. This event not only attended by high-level private sectors, but also regulators plus national and international organizations that have been actively involved in promoting Business with Integrity, such as Corruption eradication Committee (KPK), GAKESLAB Indonesia, and Alliance for Integrity Supervisor Board.